Hi everybody, Merry Christmas and Happy new year! 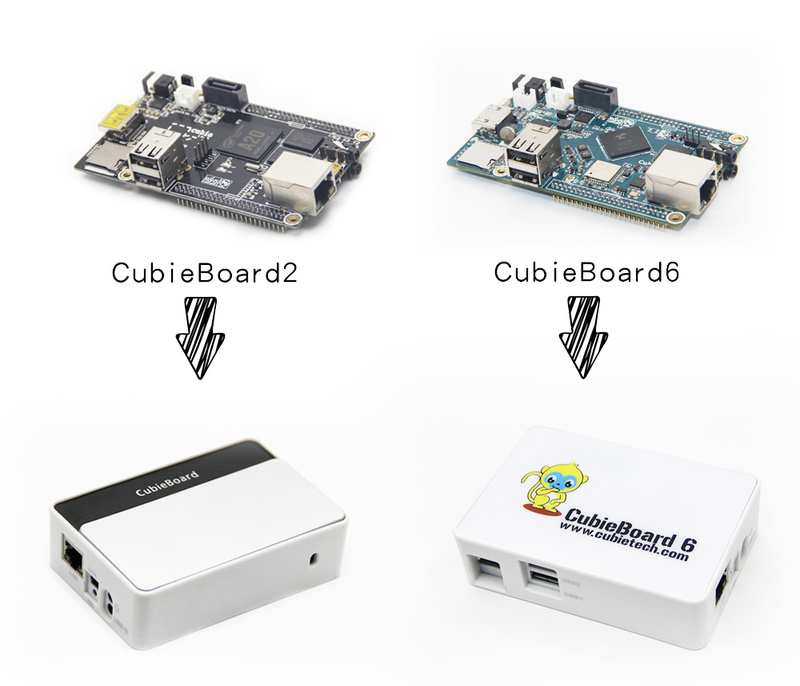 CubieBoard2 was launched on June 19 2013, it has been more than 4 years till now. CubieBoard2 is a very small size open source single board computer (SBC)which runs Android and many Linux open source operating systems. Because of its low cost, low power consumption and full set of features, many famous open source projects, Linux distributions and none profit organizations define it as one of the default supported devices. In the rising life period CubieBoard2 attracted a lot of hobbyists and makers. Due to the rich GPIO and feature expansion capacity, CubieBoard2 also springing out many many innovative projects and terminal products. Even till now, CubieBoard2 has a large amount of shipment every month. CubieBoard2 is a CubieTech’s creative board pattern that is compatible with CubieBoard1. Through several years development, they have been built up a rich hardware and software ecology, including the sub-boards, carrier boards, accessories, drivers, Linux distros… However, the application software become more and more cumbersome, and they need larger RAM, faster CPU and GPU. In addition, people always hope a smoother operating experience. So one year ago, we started to develop the upgraded model of CubieBoard2, it was named CubieBoard6 from the time sequence. By now we have run several batch mass production and we also have sizeable shipment in China. So here we are very glad to announce to the whole world that CubieBoard6 is available. And next I would like to describe the difference points between CubieBoard6 and CubieBoard2 in dimensions, features and performance etc. aspects. CubieBoard6 was designed to be compatible with CubieBoard2 on physical dimension from the very beginning. And we thought the most important thing of compatible design is to share the same case for both CubieBoard6 and CubieBoard2. Many CubieBoard users know CubieBoard2 has a plastic case that is widely used. As the following photos, CubieBoard6 can also be installed into this case. And we made a newly designed totally enclosed cover plate for it. CubieBoard6 was defined as an upgraded product of CubieBoard2, we think there should be very sufficient reasons. First of all, we thought we need to find a more powerful main chip. And most important is that the main chip vendor company shall have open and inclusive approach. 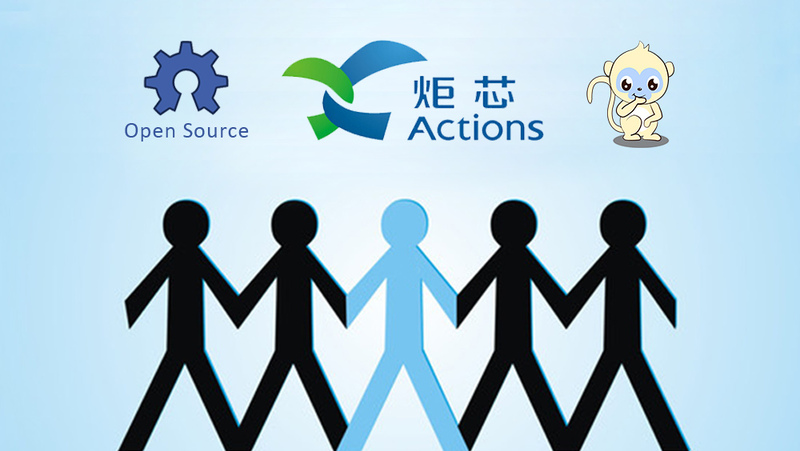 The main chip company is willing to continuously support the open source community. Finally we found the S500 main chip and Actions technology company and started the significant cooperation. Secondly, in the product features we also wanted to make it better. 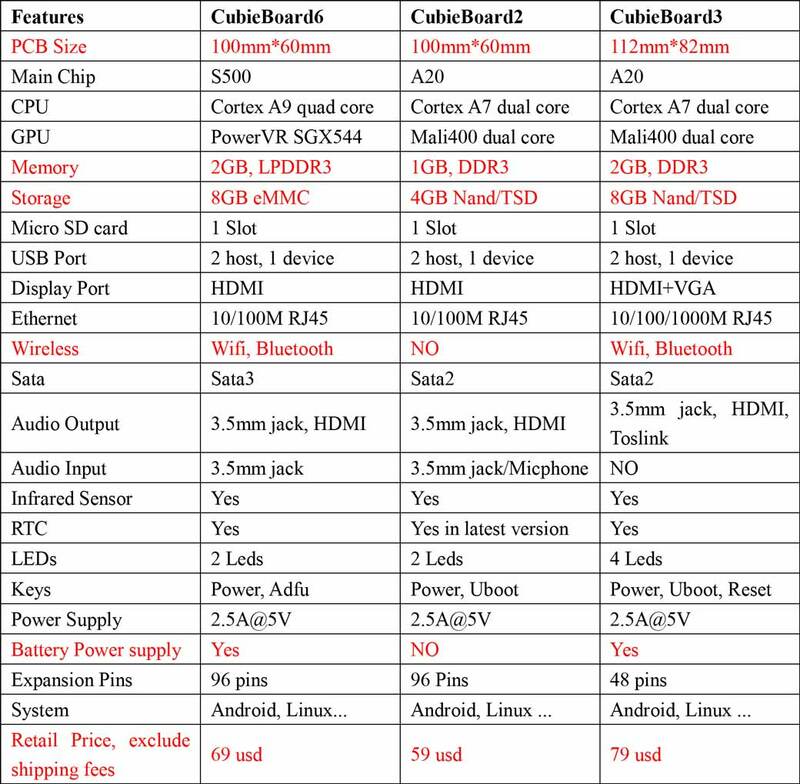 Shown as the below table, compared with CubieBoard2 within the 100mm*60mm board size, CubieBoard6 has 2GB LPDDR3 memory, integrated Wifi&Bluetooth module on board, and support Li-Po battery power input. The 2GB RAM is to meet the more heavy computing program. Onboard Wifi&Bluetooth module is to avoid extend the wireless network function from USB port since more and more applications need to link with network. The battery power feature is to make it more suitable for mobile applications. And S500 has USB3.0 port, we converted it to the SATA3.0 port, and we found the SATA speed is quite fast among the embedded boards. Lastly, the 8GB eMMC storage is a very cost-effective choice, since 4GB eMMC chips are almost end of life in the market. Usually in order to evaluate a product’s performance, we have to select a comparison object. Here we choose the CubieBoard2 which use Allwinner’s A20 main chip mainly for two reasons. The first one, CubieBoard2 is also belong to CubieTech, so everyone believes we will keep the data trustworthy, that makes all the test results are reading significance . The second reason is that Allwinner’s A20 has good reputation in developer community and various industries. CubieBoard6 is an open source hardware that supports open source operating system, such as Android and Linux distros…Here we select Android and Linux Debian system to test the board’s CPU and GPU performance. Generally speaking, CubieBoard6 which adopts Actions S500 Quad-Core SOC has about 2 times comprehensive performance improvement against the CubieBoard2. 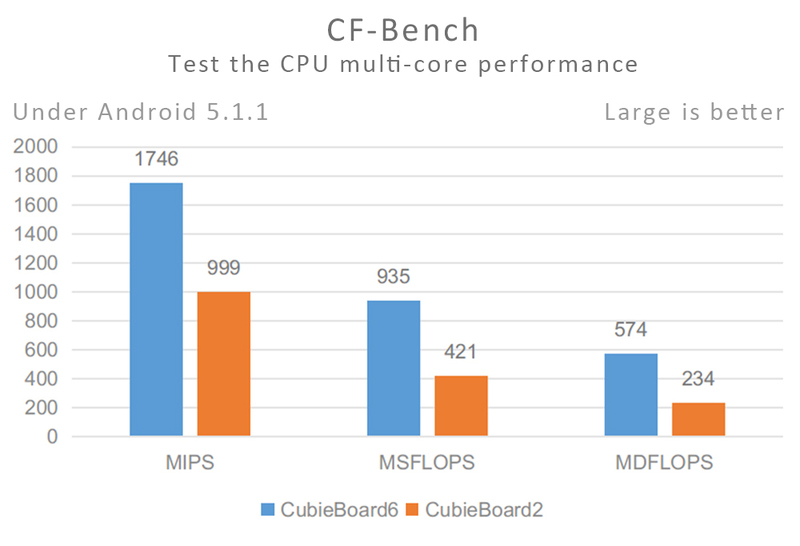 As shown in the above figure , in the Android 5.1.1 system, we choose CF-Bench to test the CPU’s integral-point operation and floating-point operation performance. 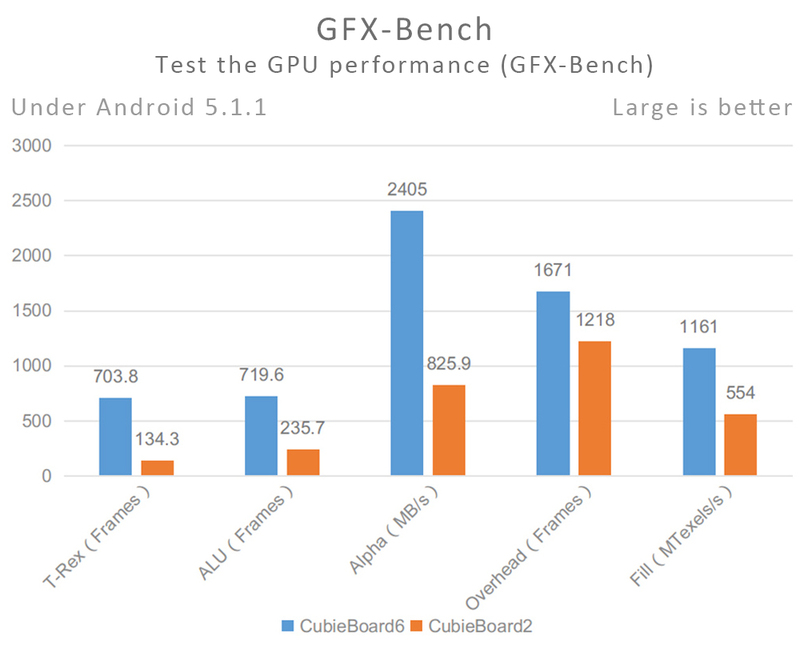 As shown in the above figure , in the Android 5.1.1 system, we choose GFX-Bench to test the GPU’s performance. Most of the test results get more than 2 times improvement. As shown in the above figure , in Linux Debian system, we choose Supper- ᴫ to test the CPU performance. Please note, for test result is that small is better. 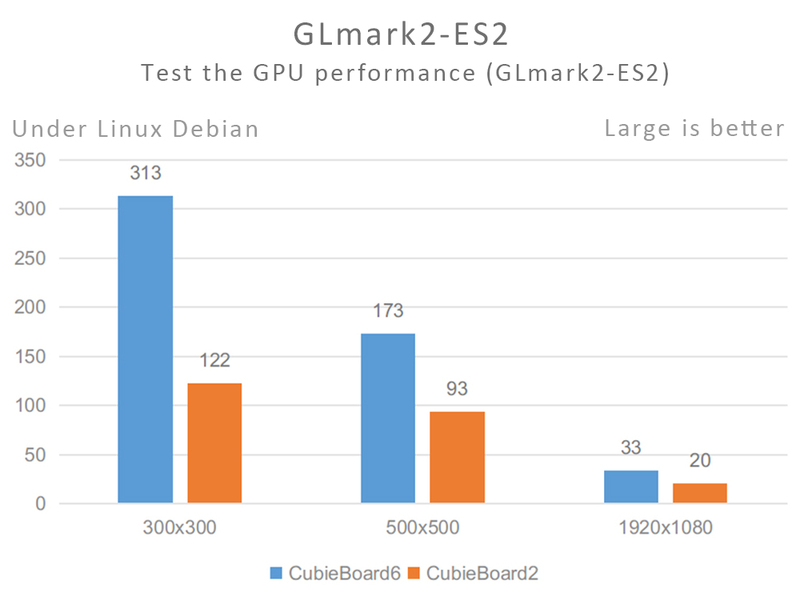 In the above figure , under Linux Debian system, we choose GLmark2-ES2to test the GPU performance. That means we enable the Imagination PowerVR SGX544 GPU in Linux system. We firstly release the standard version, it is rather high configuration, and has 2GB LPDDR, 8GB eMMC , and Wifi&BT module on board. The recommended retailed price is 69USD/unit excluding shipping fee. Some of the distributors would tag the price within the shipping fees, so the terminal price usually would be higher than 69USD.